In this country rabbits are generally considered to be a childrens” pet and for many they are the first real experience of caring for an animal. However, there are also certain breeds that are farmed either for meat or, as this article discusses, for their extraordinarily warm and soft ’wool’. Angoras are an ancient breed that originated in Ankara (Angora) in Turkey. Their wool is extremely fine and softer than cashmere so it may be surprising that there are very few breeders of Angoras in this country – even on a small scale. Across the pond in the States the breed is very much more popular and they are widely kept for showing, fibre production and as pets. There are national and local networks of clubs and associations and here Phill and Judy Osborn of aBUNdance Acres Fiber Farm – members of National Angora Rabbit Breeders Club – give some insight into keeping Angoras for their their luxurious fibre. When choosing Angoras as a source of fibre the first decision that must be made is “What rabbits shall I keep?” There are five basic breeds of Angora rabbit: English, French, German, Giant, and Satin. The various breeds produce differing quantities of fibre and require differing amounts of grooming to keep the coat in good condition. Of course there are other significant differences within the breeds as well, so keep that in mind before purchasing. Germans, and Giants (that were developed primarily using German stock) are the highest producers and are relatively low maintenance. French are the lowest maintenance and have a higher percentage of guard (long straight) hair which imparts a more intense color to the fibre, and the resulting yarn. English are a great show rabbit and are ‘just so darn cute’. Their wool is the softest, but therefore also requires the highest maintenance and the production level is usually low, especially compared with the German or Giant. 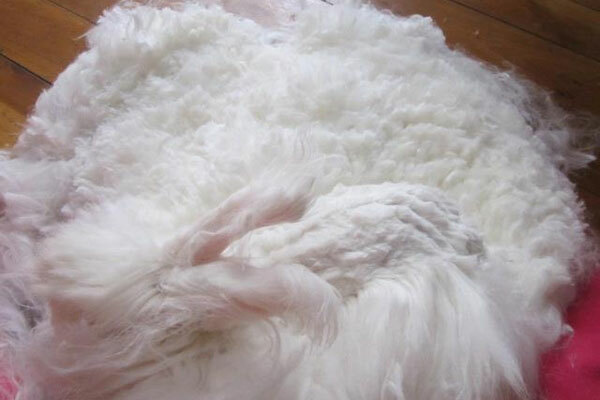 The Satin Angora which originated as a variant of standard Satin rabbits, has the lowest production, but what they do produce is spectacular. The sheen of the fibre really sets it apart, but they are often high maintenance as well since their fibre is even finer than the other breeds. As with any rabbit, care begins with selecting the proper cage size. Although individual outdoor hutches may be used, most breeders with more that just a couple of rabbits use all wire cages inside an outbuilding. These can be stacked in frames built for that purpose, or suspended from the ceiling or rafters. The minimum cage size for an adult Giant is 80cm x 80cm with larger French rabbits also requiring this much space. We also generally suggest a 40cm height as opposed to the 35 or even 30cm ones used for normally furred breeds. 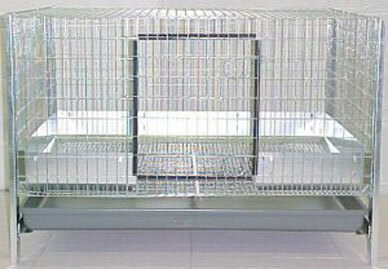 The English and Satins usually have sufficient space in a 60cm x 60cm cage but, if you have the room, don’t be afraid to go larger. Of course smaller cages may be used for young growing stock, while a doe with a litter may need more space, especially as they approach weaning. Cages housing Angora rabbits will require more maintenance than those housing shorter furred animals due to the excess fibre and the ‘strings of pearls’ they produce. If you are not familiar with that term, it refers to groups of faecal pellets connected by hair fibres. Cleaning the cage with a stiff wire brush is required at least once a week, and preferably more often, especially if you notice a buildup. If the strings of pearls increase significantly in number, or the connections start to look more like cord than fine thread, this can be a good indicator of another problem that is more prevalent in Angoras, namely, wool block, otherwise referred to as hair balls or fur balls. 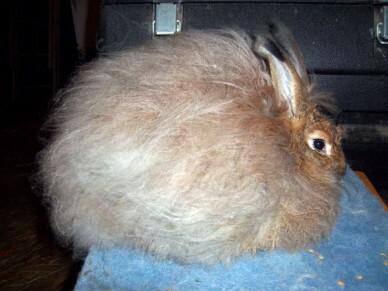 All rabbits can be prone to this but the longer fibre of the Angora coat multiplies the possibility and because rabbits’ stomachs are glandular tissue, as opposed to the muscular stomach of a cat for example, rabbits cannot “cough up” their hair balls. Hair, though made up of protein, is indigestible and must pass through the system. A wool block will usually be made up of feed as well as fibre and substances such as papaya (or similar)are often suggested as a remedy, as this may help break down the “non-hair” portion making the remaining block easier to pass. There are also gooey substances similar to cat hair-ball treatments, but flavoured with peanut butter rather than fish. These will help lubricate the gut to ease passage and also provide some nutrition for a rabbit that has gone off feed. If you can find a copy of Kilfoyle and Samson’s Completely Angora (out of print) at a reasonable price it contains a recipe for a wool block treatment as well as a wealth of other tips and information. However, prevention is better than cure and keeping the cages free of extraneous wool will help reduce ingestion in the first place. This is one area where an Angora, kept exclusively or primarily for fibre production, will have an advantage over one being kept for show – regular and more frequent removal of the coat. The main defense against wool block is diet. We assume that most rabbits’ diets consist primarily of commercial pellets, perhaps with a few added treats. One common practice with Angora rabbits is to supplement daily with grass hay, then have one day a week feeding hay only. This gives the digestive system a break from the normal ration and helps keep things moving along. Note: Alfalfa is not recommended. Alfalfa meal is often the main ingredient in commercial pellets and rabbits do not need the additional calcium provided by alfalfa hay as well. The next main concern of raising fibre rabbits is grooming. All young rabbits have relatively soft coats and require fairly frequent grooming to keep the coat from matting or felting and becoming worthless for spinning. Once the rabbits have matured, most French and many Giants will require little or no grooming if the coat is being harvested every 3-4 months. With Giants we often clip the “baby” coat as early as 2 months, just to get it out of the way. The fibre will not be prime for spinning, but can be used for other projects and you get an earlier start on the next, spinnable coat. You will need to examine and determine for yourself how often your rabbits will need to be groomed. Nothing is more discouraging than going to harvest a beautiful coat of Angora and finding it has webbed at the skin level and comes off the rabbit in one big ‘fleece.’ While there are many interesting craft projects that can be made with such a mass of fibre, it is useless for spinning. And while people who raise rabbits for fibre may save their “seconds,” i.e., short pieces, face wool, 2nd cuts, etc., for felting, the prime fibre, meaning free flowing, clean and at least 3” long, is much more valuable. Spot the bunny – a recently shorn rabbit and its 10 ounce fleece. There is some debate as to how long the fibre should be before harvesting. Of course, if you are working with a breed that moults, the rabbit may make that decision for you. But when working with rabbits that must be shorn, such as the Germans, it is up to you. Some think that longer is better. My personal opinion is that this is primarily “show rabbit” thinking. As long as the fibre is at least 3” long, it is considered “prime” for pricing purposes. Unless you plan to spin it yourself and you have a preference for longer fibre, this should be your main consideration. Leaving the coat on longer requires more grooming and risks losing some or all of it to matting or webbing. If you do sometimes show your rabbits, you may consider it worth the effort and risk. But do not kid yourself that you are increasing the sale value of your fibre harvest. Over the lifetime of the rabbit you will harvest more prime fibre by sticking to the minimum length. Those with German Angoras will often say you should establish a schedule, e.g., 3 months, and stick to it, regardless of length. One more thing to mention is wool mites. If you are familiar with normal furred rabbits, you know they can be susceptible to ear mites, especially if your rabbitry is not bird proof. Wool mites are similar microscopic ‘beasties’ the primary symptom of which is dandruff. This will be most easily seen if you are using a blower to groom, or when clipping or plucking bald. The most common treatment in the US is Ivermectin, a parasiticide used in large animals. Use in rabbits is “off label” so do not use it on any animal that may end up being butchered and be cautious using it on pregnant does. Due to rabbits’ high metabolism, the dosage based on weight is higher than sheep, cattle, etc. I have heard rates ranging from 2-5 times that shown on the label. One advantage of Ivermectin is that it will take care of ear mites as well if those are a problem in your rabbitry. (fleas and lice too, but I hope you do not have those problems.) Note: before using Ivermectin sourced in the UK you should take advice from a vet to ensure that it is the same product chemically and in case there is an alternative recommended product available in the UK. There are other more imaginative treatments as well. Bob Shaftoe, sadly recently deceased ARBA judge, went around for decades recommending that Angora exhibitors comb Listerine through the rabbit’s coat. How many rabbits will you need? A few facts and figures here to give you some idea of how many rabbits you need to keep in order to produce enough fibre for personal or commercial consumption. 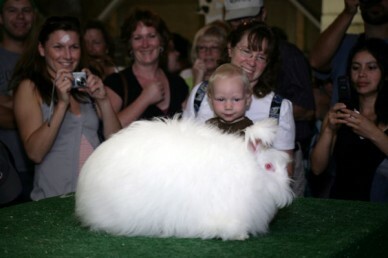 Giant Angora are considered the commercial breed and will produce about 1-1.5kg of prime wool a year. A French or English will yield about 0.5-0.75 kg per annum. There are, of course, other factors that will affect the final amount of spun wool produced or needed for a project and these will include: 1. The percentage of Angora that is going to be used. Angora is often blended with other wools not only because it is expensive as a raw product but it is also the second warmest fibre on the planet (Musk Ox is the warmest) at 6-8 times warmer than sheep’s wool. When blended it still creates a wonderfully soft and insulating product. 2. The size of needle/hook you use. 3. If your work is loosely done or you tend to have tighter needlework. 4. The weight of yarn your pattern needs. Bulky weight wool would require more wool than baby weight. I hope this has given you enough information to pique your interest and consider raising Angora rabbits to provide yourself and others with one of the most luxurious fibres in the world. It has to be said that even though we have only really considered them as a fibre provider in this article they do have lovely temperaments which also makes them excellent pets for those willing to put in the extra maintenance required. I want to purchase an angoran jumper but don’t want to buy off a chain of shops that uses Chinese farms. Is there a list of local UK chains that the industry uses or national chains definitely to be avoided? I’m looking to buy a cage for my new bunny, I don’t have him yet, but it won’t be long. I want a cage like the one in your picture above. I am in the UK and thus far have been unable to find anything or a company that will ship to the UK. Where can you get the wire hutches pictured here? Try searching Amazon or eBay for any combination of these terms: ‘Miller’, ‘Little Giant’, ‘Pet Lodge’, rabbit cage.